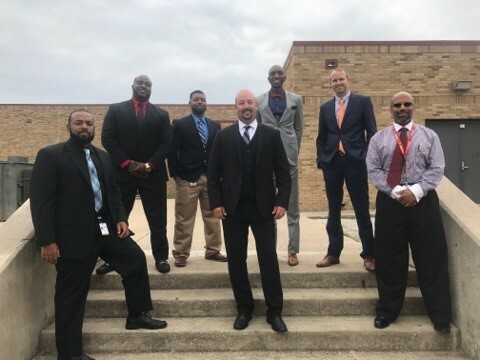 Knights of Tomorrow launched in 2017 at TA Howard Middle School as an all-male 7th Grade Team with the focus of growing successful men inside and outside of the classroom setting. It was an opportunity for male students to receive all of their core content instruction in an all-male setting. T.A. Howard's program meets the specific learning need for males through three research-based best practices: the use of visual aids, movement within the classroom setting and a need for competition. Although their core classes (English, Math, Science and Social Studies) contain all-male students taught by a male teacher, KOT students can still partake in other extracurricular activities. A special education teacher is also designated to the program. There are approximately 96 students enrolled in T.A. Howard's KOT program, and seven teachers are part of the program. Knights of Tomorrow is a gender-based educational choice for male students of T. A. Howard Middle School. Our mission is to inspire and educate young men to be productive citizens. An enriching educational experience provided by positive relationships and meeting the academic, social, and emotional needs of male students. The Knights of Tomorrow students will be the example of how T. A. Howard and Mansfield ISD’s core values manifest in students. T. A. Howard will focus on delivering quality instruction embedded with one core value each six week grading period. Our teachers will support students in the integration of the core values into their daily lives and measure their success with accountability measures. The Knights of Tomorrow educators will use research based instructional strategies designed to meet the needs of male students. These instructional strategies will include: embedded visual aids, purposeful movement for kinesthetic learning, lessons embedded with competition and lessons embedded with Mansfield ISD’s core values. Our character education components will consist of Guest Speakers, Group Activities, Community Service, Field Trips, Mentoring Program and Accountability Measures. Parent and community involvement aspects will include Curriculum Nights, Accountability Measures, Chaperoning Field Trips, Award Ceremonies and Innovation Days. DEADLINE IS Tuesday, April 9th, 2019. For more information about T.A. Howard's Knights of Tomorrow program, email Steve Buchan at stevenbuchan@misdmail.org.